A few months after Doug and I moved to South Carolina, we bumped into an old NJ friend at the St. Sarkis Food Festival in Charlotte, NC. What a surprise it was to see our friend Andy, whom we hadn’t seen in 50 years! It turns out that Andy and his wife Linda live just a few miles from us - but just across the state line. We’ve gotten together several times sharing good (Armenian) food and stories of decades gone by. Recently, Doug and I were invited to their home for a delicious lunch and a tour of the nearby Alphabet Museum, a truly interesting place! The museum traces the history of the world’s alphabets in an array of very impressive displays. You can imagine how delighted we were to see the Armenian alphabet exhibit featuring Mesrob Mashdots! His greatest achievement was inventing and systematizing the Armenian alphabet in 406 AD. After our outting, we headed back to Andy and Linda’s for dessert and coffee. Since it’s officially apple season, my contribution to the meal was an apple galette – a French version of an apple pie. I realize it’s not an Armenian recipe, but at least it was made by one! Roll the pie crust dough or puff pastry dough into a thin, 12-inch circle. Place it on an ungreased baking sheet; cover with plastic wrap and refrigerate for 30 minutes. Meantime, mix together all of the filling ingredients, tossing gently to coat apples. Remove crust from the refrigerator and uncover. Arrange the apples in a mound in the center of the crust, leaving a 2-inch border of dough. Gently fold the dough edge over the apples, pleating loosely as you go. Leave the apples in the center uncovered. Brush dough surface with egg wash. Lightly sprinkle sugar over the crust and apples, if you like. Bake for about 30-40 minutes, or until the dough is golden brown. 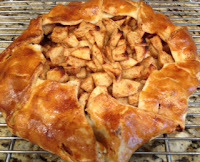 Cool galette on the baking sheet for 10-15 minutes, then carefully slide it onto a wire rack to cool completely. Carefully transfer the galette onto a serving platter. To Serve: The galette is delicious on its own, but may also be served with freshly whipped cream or a good-quality ice cream.